Vehicles are such a huge part of our everyday life; it’s common for every family to have at least one car. With everyone’s busy schedule, it’s important to advertise where consumers are. 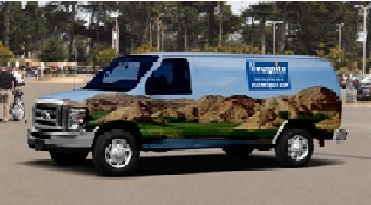 One of the best ways to advertise is use everyday items, such as vehicle graphics, to your advantage. Companies all around are taking their cars, trucks, and vans and displaying them with their companies’ advertisements. Driving down the street you will see several different types of advertisements specially designed for cars. You will see Vehicle Wraps, Vehicle Magnets, Custom Car Covers, and Tailgate Stands. Each one has a different purpose and use. Our Vehicle Wraps are a high performance, large-format digitally printed vinyl that adheres to your vehicle’s painted surface without any damage. Each print is laminated to provide durability from scratches as well as UV light. Our vehicle wraps are removable and do not damage the original paint. When the wrap is removed, the paint will look just as pristine as it was before. We are able to wrap any vehicle, no matter the make or size. We are able to print any color, any design or logo. The sky is the limit with this product! Our Vehicle Magnets will turn your car into a mobile billboard! They will give your car a professional feel. Customize your own magnets with your own design and logo! Our magnets are completely removable, and will not damage your paint. They have been tested for outdoor use for over one year. These magnets are very durable and are sure to grab attention all around town! Our Custom Car Covers are fitted to cover any vehicle, using the finest materials with high quality craftsmanship. The breathable fabric allows excess moisture to evaporate and keep the heat to a minimum during the hot summer months. 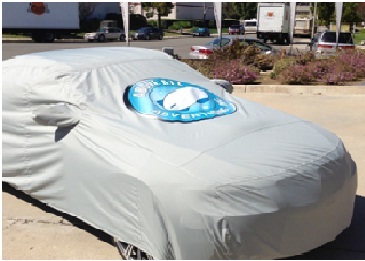 Our Custom Car Covers are designed for a specific model and make. When ordering a Custom Car Cover, be sure to include all details of the car including any and all body modifications as our Custom Car Covers are designed to have a snug fit all around with the long and low coverage to keep the wheels clean. 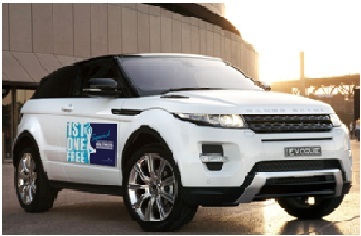 Personalizing your car cover is now a reality! 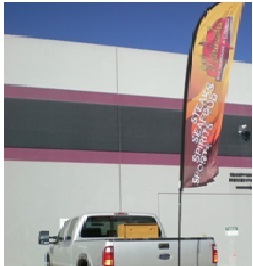 Our tailgate stands are designed to let you post your banner or flag in the tailgate to show off while having fun. Our easy to use design will work on both cars and trucks and easily adapts to any tailgate. We suggest these for stationary vehicles only.